A Demonstration Version of ShellSIM with limited capability is available online, subject to User Registration alone, using the Software as a Service (SaaS) approach that enables the User to run ShellSIM remotely from anywhere with an internet connection, accessing ShellSIM behind a firewall on server at Plymouth Marine Laboratory. The Full Version of ShellSIM with complete capability is available as executable code within a software program compiled as Dynamic Link Library (DLL) using the Microsoft.NET framework, thereby ensuring easy linkage with other programs using any of the many software languages supported by .NET (e.g. C#, Visual Basic, Java). Availability of that Full Version is subject to Plymouth Marine Laboratory's (PML) Licence Agreement for nominal fee of £50 within the context of collaborative work, and which fee is negotiable within commercial contexts, subject to any required training from PML. The Table below summarizes differences between the Demonstration and Full Versions of ShellSIM. Users may use an unrestricted number of sectors each with an unrestricted number of populations within. 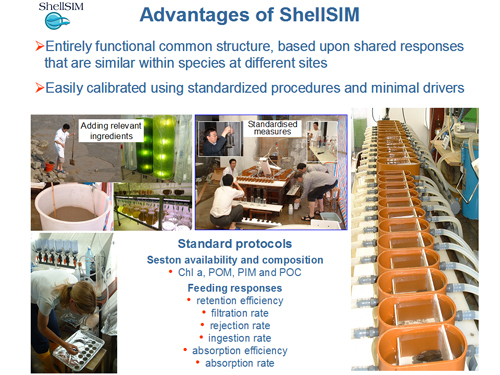 Consultation with Plymouth Marine Laboratory will enable the Licensed User to apply ShellSIM for validated species at new sites, and/or the collaborative application of standardised protocols that enable efficient and cost effective calibration and validation of ShellSIM for new shellfish species. If you are interested in either of the above, including variations thereof, talk to us! (iii) average organic carbon or energy contents of tissue and shell. Some of the above information is likely to be known, or might be assumed. However, where new measures are necessary for calibration, then protocols have been established, and portable equipment designed that enables study under natural conditions (illustrated below). Before ShellSIM can be run, the User defines the culture area, environmental conditions and details of shellfish husbandry, all described under Initialisation Options on the Description page. Forcing (i.e. driver) data are required that define the time-dependency of environmental conditions, also as described under Initialisation Options. Among those forcing data, it is essential that CHL, TPM, POM and PIM are measured according to standardised protocols that have consistently been used during calibration of ShellSIM to date. If ShellSIM is driven by data measured using different protocols, there can be no guarantee that feeding, growth and other responses will be accurately simulated. Certainly, incompatible driver data may compromise comparisons of relative performance, whether in the same or separate species. 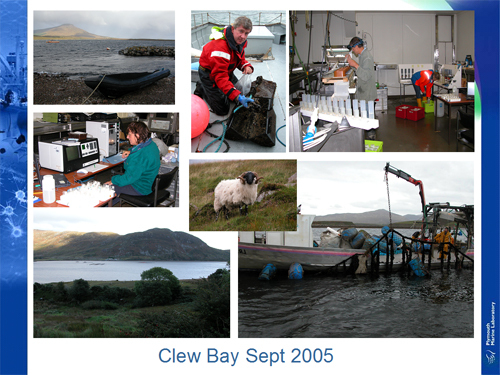 To validate ShellSIM, data are required describing shellfish growth and/or environmental impact at each site, and which should ideally have been measured coincident in space and time with the above driver data. Plymouth Marine Laboratory can provide advice and/or training in measurements of driver data (i.e. forcing functions) and shellfish growth. Full conditions of use are described on the Legal page of this website. ShellSIM uses state-of-the-art equations to simulate shellfish responses, but is neither infallible nor fool proof. Therefore, neither Dr. A. J. S. Hawkins nor Plymouth Marine Laboratory can accept any liability for losses or consequential damages due to its application.